Is great coffee magical? Kind of . . . sure, why not. Is it magic? No! I was lucky to experience the emerging coffee culture in Portland Oregon and lucky enough to learn about great coffee. While it might look like tattoos, beards, and vintage flannel are requirements for an amazing cup of coffee, the truth is that magical coffee doesn’t take that much. All you need is 5 minutes, great beans, good equipment, and the right pour-over recipe. Simple! Right? Well, it’s mostly simple. Certainly simple enough to brew really good coffee consistently. With some basic recipe settings, good equipment, and good beans, the parameters above can be generalized to produce consistently good pour-over coffee. Well, that’s the theory. So . . . what can push your coffee over the edge and into great-ness? Fortunately, that’s a somewhat subjective concept. If you think it’s great, then it’s great coffee. Do you like a little citrus in your coffee? Maybe you like a more bold and nutty flavor? Changing some of the parameters alter that flavor. You can create a coffee that lands more lightly on your palate and a coffee that hits with a more bold and rich flavor . . . often from the same bean. That’s the wonderful art of coffee. You can start with a basic recipe and alter these parameters to draw different flavors from your bean. It’s a little science, a little art, and if done well, it seems like magic. Or, maybe it’s just great coffee. 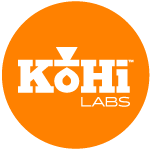 We at KoHi Labs wanted to build a simple product that is based on a little bit science, helps everyone become a little bit of an artist, and helps capture the magic of great coffee. We hope you enjoy our little KoHi Labs coffee timer for the iPhone .